We all do it, open the fridge, stare in, then close the door. Then we open it again and stare some more, wondering, hoping “is there anything in there to eat”? I find, more often than not, the answer is “yes!” There is always “something” in there to eat, if you know how to cook. And, challenging yourself to come up with “something” from “nothing” is a great way to exercise your creativity, as we teach in our cooking team building innovation workshops. In these days of convenience food we are accustomed to pulling out a frozen TV dinner and throwing it in the oven or microwave, ordering takeaway or heating a pouch of soup. Is this really how you want to spend your cooking life? Do you really want big corporations to manufacture every last detail of your life, your leisure time, your every waking and eating moment? If not, it’s time to cook something. Every time you throw food away you are losing money, increasing your load on the environment and you are not caring for yourself. So what’s in the fridge you can make? Eggs? A variety of take away containers, or remnants of last nights curry? Add that to the eggs and make an omelette! Throw those chicken bones and leftover chicken into some water and make a stock. Freeze it or use it to make your own soup. Take those odd bits of veggies and chop them up, add some pasta or beans (tinned or rehydrated). There are heaps of websites loaded with tips on making use of your leftovers, so do some advance research and try to keep a few basics on hand in the pantry. Or, try Googling a few things you have at hand (that might go together) – you’ll be surprised how many recipes turn up. If you need to brush up on your technique, try our Learn to be a Chef cooking class (think of it as cookery bootcamp) to learn or improve your basics. 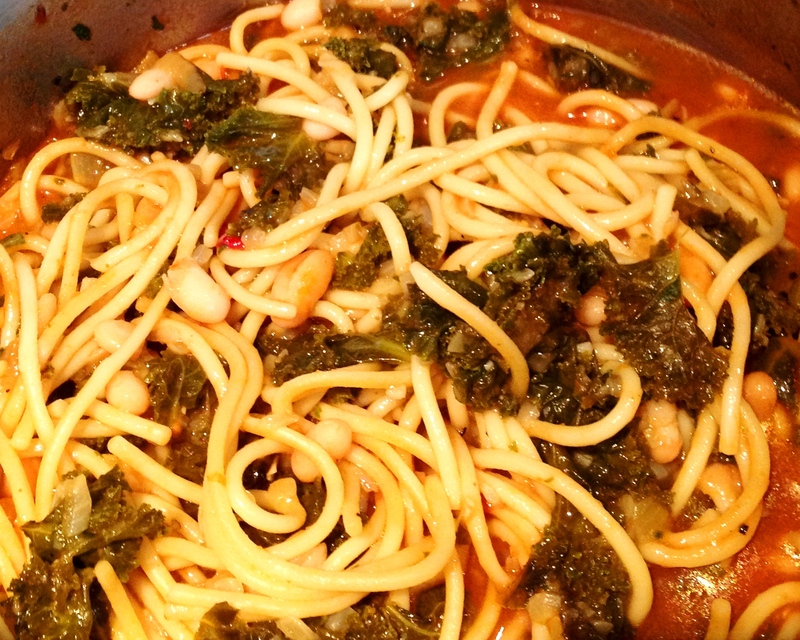 Today I made a wonderful Italian-inspired Kale and Pasta Soup from little more than the leftovers in my fridge. It will provide a few meals, so I saved money plus I got a home cooked meal and enjoyed the process. So stop staring at the fridge, it’s going nowhere and neither are you if you don’t learn how to be creative and use your leftovers. 6 cups chicken stock (homemade and stored in the freezer). Use cubes if you have to! 1. Add olive oil to medium-sized pot and heat over medium flame. Toss in onions and cook for about 4 minutes till translucent. Add the garlic and continue cooking for 2 minutes. 2. Toss in the kale and mix well. Cook another 4 minutes. 4. Toss in the pasta. Cook at a boil for 10 minutes or till al dente. 5. When pasta is cooked, toss in the left over pizza sauce, cannelloni beans, parmesan, roasted capsicum and salt and pepper, heat through. 6. Serve with any fresh herb you can get your hands on, basil, thyme or parsley preferred. If not forget it. 7. Enjoy the fact that you didn’t rely on a major corporation to take control of your cooking life. Yes you did it! 8. Finally if you have any cooked chicken around, tear up some pieces and toss it all in!!! 9. See you had something in the fridge all the time, no more starring!